This time of year, we keep a close eye on the weather. By Thursday I saw they were predicting gale force wind for the weekend, and that is never good for the Farmers Market. I have learned the you cannot trust the weather forecast and quite often the storms they predict fizzle out. I have also learned that even if the storm isn’t what they predicted, the threat keeps people away from the market. Being right on the water, the tents at the market get hit by the wind pretty hard. So we sent extra weights, came up with a game plan for stormy weather, told the crew to pick 1/2 the amount of vegetables, cut the staff back to bare bones and planned for a cold, wet, miserable day. For those people who shop the market in spite of the weather, you are our heroes! Doing the market is a lot of work, doing it when you are cold and wet and afraid that your tent is going to blow away, well it just isn’t very pleasant. To have people come out and shop makes it all worthwhile. I couldn’t go down this weekend because of a private party here on the farm, but our crew rocked it! Joyce, Havel, Cory and Eric made the day happen. And even though the market shut down 2 hours early, they sold out of eggs and had a pretty fantastic day. The market is where Eatwell got its start. And one of the last things Nigel made me promise was to never miss a market. Eatwell has a perfect attendance record, we have never missed one yet, but that is only possible because of our amazing crew! *Acorn or Spaghetti Squash- Store in a cool, dark, well ventilated place. Many growers say winter squash gets sweeter if they're stored for a week or so before eaten. Will last several weeks. *Arugula or Red Kale- Wash and dry well. Wrap with a damp paper towel and store in a glass container in the fridge. Lasts up to 5 days. *Daikon or Watermelon Radish- Cut the top off the Daikon to help keep moisture in the roots, store the Daikon in a closed container in the fridge and they should last for up to two weeks if not more. A wet paper towel can also be placed in the container to help maintain humidity and keep the roots from wilting. Mandarins- They will keep a day or two at room temperature and up to a week in the crisper drawer of the refrigerator. Radicchio/Chicory- Refrigerate in a sealed plastic bag. Keeps for a week. Heat the oil over medium heat in a large, heavy soup pot. Add the onion and cook, stirring, until tender, about 5 minutes. Add the grated potato, the shredded cabbage and 1/2 teaspoon salt. Stir together for a minute, taking care that the potatoes don’t stick to the pot, and add the water or stock, the Parmesan rind, and salt and pepper to taste. Bring to a simmer, cover and simmer over low heat for 30 minutes, until the vegetables are tender. Add the milk to the soup. Stir to combine well and heat through without boiling. A handful at a time, stir the Gruyère into the soup and continue to stir until the cheese has melted. Taste and adjust seasonings. Remove the Parmesan rind. Serve, garnishing each bowl with a handful or toasted croutons and a sprinkling of minced chives. With a sharp knife, cut away both ends of one of the grapefruit. Stand the fruit on one of its cut ends and slice off the skin in strips (try to get all the bitter white pith). Working over a bowl, cut the segments free from the membrane, letting each segment fall into the bowl as you go. When you’ve removed all the segments, squeeze the membrane to extract all the juice. Repeat with the second fruit. Spoon out the grapefruit segments from the bowl and set them aside on a plate. Remove any seeds from the juice.Measure out 3 Tbs. juice into a small bowl. Save the rest for another use (or drink it). Whisk the lime juice, honey, and salt into the grapefruit juice. Whisk in the oil and then the chopped mint. Drag an arugula leaf though the vinaigrette and taste for seasoning. Drizzle about 1 Tbs of the vinaigrette over the grapefruit segments. Combine the arugula and radicchio in a large bowl. Toss with enough of the vinaigrette to evenly but lightly coat the leaves (you may not need all of it). Arrange the greens on six salad plates and garnish with the grapefruit segments, almonds, and a few mint leaves. My friend Mark makes this dish all the time, it is probably his favorite dinner to cook. 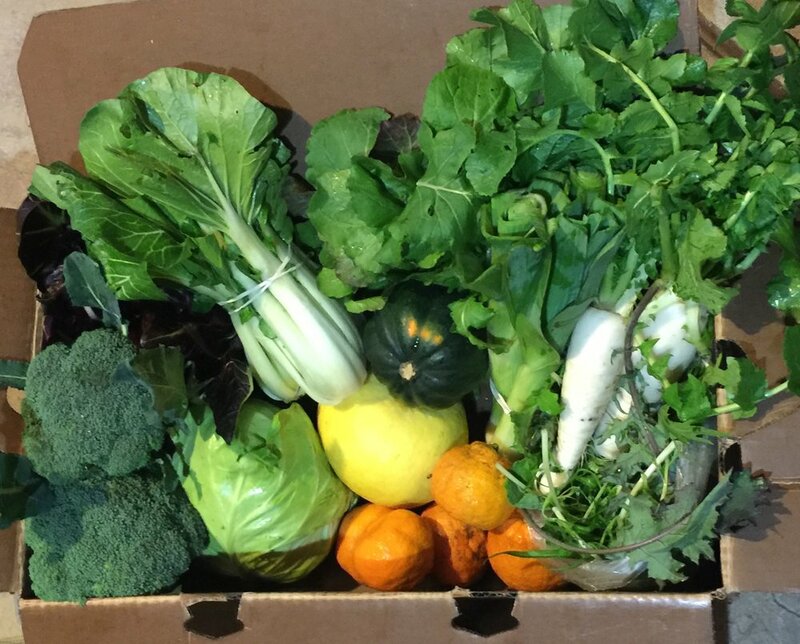 I am amending it by adding the broccoli from this week’s share. Heat the oil in a large pot over medium low heat. Add the onions, or leeks and minced garlic and cook for a few minutes until the onions are fragrant and softened. Add the chicken to the cooking onion/leek/garlic and cook for 2-3 minutes, browning it a little. Add curry powder and paste; cook for 3-5 minutes. Add the coconut milk, and broccoli and mix well. Let simmer for 15-20 minutes or until the chicken is fully cooked. Add water or chicken stock depending on the consistency you want for the sauce, or let simmer longer to thicken if needed. Stir in the brown sugar, fish sauce, and lime juice. Taste and salt if needed. Top with fresh cilantro, serve over cooked rice or spaghetti squash. Or you could get really fancy, roast up your Acorn Squash and serve it in the squash halves. Happy New Year And I Hope You Remembered to Eat Your Cabbage! I grew up with my mother’s German tradition of eating pork roast and sauerkraut on New Year’s Day. My mom always told me you have to eat some sort of cabbage on NY Day to bring good fortune in the coming year. I never thought much about it, but I did continue that tradition in my own home. This year is no different, we will enjoy a ham from our friends George and Anne House, and some Eatwell Red Cabbage for our New Year’s gathering. But today, as I was thinking about what to write for this week’s newsletter I began to wonder where this tradition came from, so I googled it. I also read that the long shreds of cabbage are meant to represent a long life. And for the pork, well a pig cannot look backwards, only forwards, and therefore only roots forward. This is meant to represent looking to the future rather than dwelling on the past. And the pig/pork roast is also a symbol of good luck for the coming year. 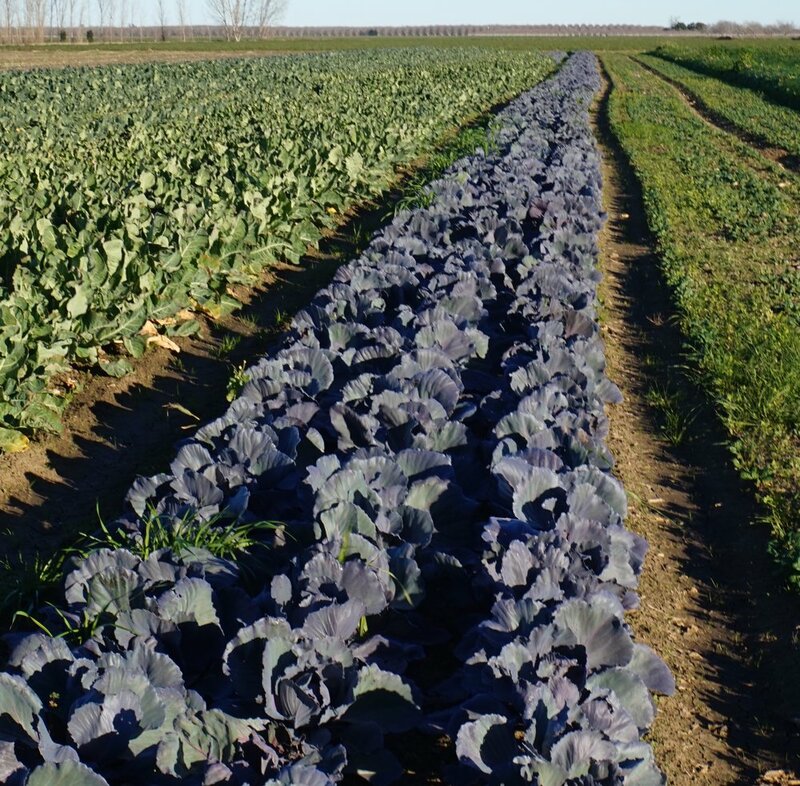 As Cameron and I walked around the farm today, for the last time this year, I couldn’t help but smile when I saw this gorgeous purple row of cabbage and look forward to our delicious New Year’s Day meal. Happy New Year Y’all! I was wondering if you could use leeks in a salad dressing, and this is what google found for me! Funny because it says specifically good for strong flavored salad greens, perfect for the arugula and radicchio! *Radicchio- Refrigerate in a sealed plastic bag. Keeps for a week. *Spaghetti Squash- Store in a cool, dark, well ventilated place. Many growers say winter squash gets sweeter if they're stored for a week or so before eaten. Will last several weeks.